We have a mixture of licenses for Microsoft Office 2010 and 2013 here and there is the occasional need to reinstall Microsoft Office such as when rebuilding a PC or migrating a user to a new computer. New installs of Microsoft Office 2010 will have issues when trying to work with Office 365 i.e. Exchange and SharePoint online. The issue will be most apparent when trying to connect Outlook with the Exchange mail server as it will continue to request login details on an infinite loop which is difficult to cancel without killing off the Outlook process in Task Manager. Microsoft Office 2010 needs to be updated to the most recent version by installing Service Pack 2 (and possibly subsequent Windows Updates that relate to Office 2010). You can determine what exact version of Office you have by doing the following. On the File tab, click Help. You will see the version information in the About Microsoft section. •	The version number of Office 2010 SP2 is greater than or equal to 14.0.7015.1000. 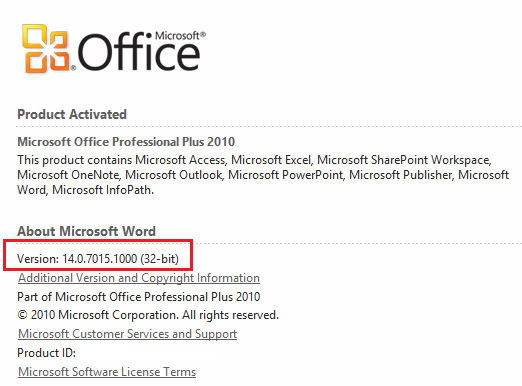 •	The version number of Office 2010 SP1 is greater than or equal to 14.0.6029.1000 but less than 14.0.7015.1000. •	The version number of the original RTM release of Office 2010 (that is, with no service pack) is greater than or equal to 14.0.4763.1000 but less than 14.0.6029.1000.